We were privileged to have the President of the Shelby County Extension Homemakers present an informative presentation to our group. Homemakers is a volunteer organization that works to improve the quality of life for families and communities through leadership development and education with the University of Kentucky Cooperative Extension Service. This is the largest educational organization in the State of Kentucky. They are proud to sponsor free annual Ovarian Cancer Screenings for all interested Homemakers. And they honor local Veterans with a Veterans Appreciation Reception. Their activities are as varied as they are numerous. To name only a few: Sewing Circle, Summer Day Trips, Kids in the Kitchen, Cooking Classes, Nutrition Programs, Knitting, Crochet and Needlework Classes. Five Specialty Clubs meet monthly at the Extension Center and new members are always encouraged to join in the fun. These clubs are Book Club, Plate It Up! 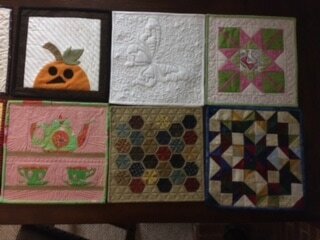 Cooking Club, Cover Lovers Quilt Guild, Milestone Quilters, and Bingo. 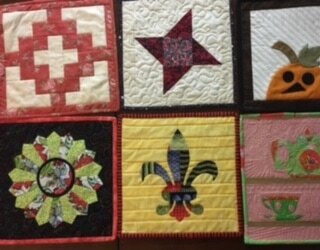 Our members were encouraged to bring a 12-inch finished quilt block to be donated to the KEHA Quilt Square Showcase and Auction. The proceeds of the auction goes to support Kentucky Extension Homemakers Association. The blocks below were reviewed and judged. The winner was Joyce Hameloth's block. Joyce received a gift card to Cozy Quilter. Congratulations Joyce!